Featherlight® Walker – W1650Comfort Mobility Inc. | Comfort Mobility Inc. The Featherlight Walker with Loop Brakes features a superb center of balance that eliminates forward tilt making for a more stable and comfortable movement. 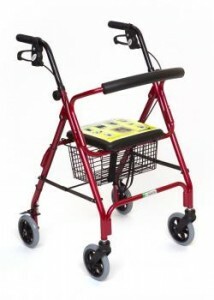 The Featherlight Walker has a Limited Lifetime Warranty on the frame and is also available in a demi model. This portable walker is made specifically for those who are 5 ft. 4 in. to 6 ft. 3 in. with a weight limit of 250 lbs. The Essential loop hand brakes are the best system available for safety, ease of use. Manufacturer: Essential Medical Supply, Inc.